35cm x 40cm clamshell style press with spring loaded gas struts to assist with opening. The DK16 is our mid-sized manual clamshell. The DK16 14x16 clamshell press opens for full access to the lower bottom table. 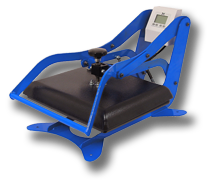 It is important to note that the back of the heat platen raises above and away the bottom table, providing better access than other clamshell presses. The frame support allows operators to slide shirts over the table with complete drape space around and underneath the loading area. Interchangeable bottom tables for smaller pressing areas are available. This press is idea for environments with space limitations, and for users who need more portability and mobility than the over-weight swingaway presses. Super-portable light machine weight - 83 lbs !